characters, and plot twists, and five writers (one has to be insane to do this) using those characters, phrases, and plots to create five individual stories. I’ve been told we will have to read parts or all of the stories, so hang onto your hats (wear a hat if possible), have a glass of wine, and enjoy the fun. 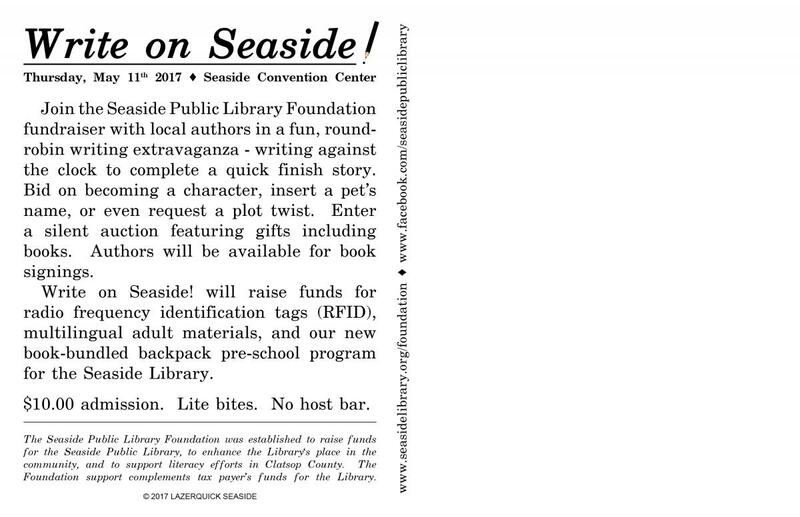 I’ll be signing Sammy and the San Juan Express books, and donating part of the sales to the Seaside Library. Join us on Thursday, May 11 23017, at the Seaside Convention Center. Sammy and the San Juan Express supports the March for our Lives in Astoria Oregon, March 24, 2018, noon.